Few months passed and we have another lovely book from Forgeworld in their expanding Warhammer Fantasy Battle list of products. As usual we decided to get a copy for our club and I am using this opportunity to write a review. 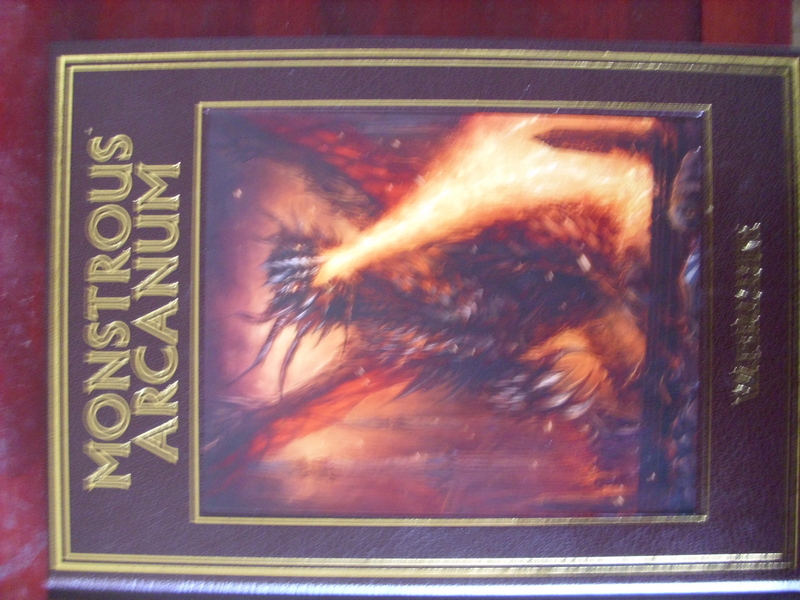 Book looks really nice- same style of cover as Tamurkhan:Throne of chaos so fake leather, nice colorful picture and every page inside made look like an old book with yellow background. As I said in my Tamurkhan review already, I think that style works really well and puts Imperial Armour books from FW to shame. For 32 pounds we get 113 pages full of very interesting content. First few pages are filled with a story of one of Tilean cities and its fight for dominance and survival.. of course with use of big monsters! This is quite a good story, introducing some new monsters and giving us “feel” how the rest of book is going to be like. There are some special rules (including few new ones such as Colossal Beast or Largest of monsters) and more magic items and artifacts to use in your games as well. Main part of the book is all about (mostly) new monsters. Very interesting idea of incarnate elementals and plenty of other creatures that can be used for Storm of Magic games or with scenarios provided in this book (I will get back to those in a moment). Some of those monsters we already know from FW website and they have miniatures available, but some others don’t have a model yet, so we can definitely expect more resin toys sooner or later. Rules are definitely not meant for competitive play though- lots of units are really overpriced for what they do and few are definitely underpricing, but this book is not meant to be used in competitive play and most units/monsters are very interesting and characterful- at the end of the day that is what counts most. A moment later we are given more opportunity to use all the new and not so new creatures in 9 brand new scenarios centered around big gribblies. They definitely look interesting and will be worth trying when you want something slightly different that your standard rulebook WHB scenarios. At the end of the book we have something I personally really like- full campaign called “They fall of Tor Karyndis” which is a 5 scenario campaign involving Skaven and high Elves and looks very promising, with some very own special characters, rules etc. that lets you play relaxed and fun few games, with outcome of one affecting next one as well. Scenarios are mix of normal rules plus some rules from SoM. Exactly my kind of stuff! Last two pages of the book have comprehensive list of all monsters and their relation to each army, divided into three categories: Abhorrent( it means your army can only ever have one of particular monster), Binding Scroll( as per Bound Monster rules) and Kinship (as many as you want within your army’s percentage limit). Always helpful to make more “fluffy” armies as one of my main problems with Storm of Magic supplement is that some of the rules and monsters you can include there are just plain ridiculous. In general it is another very nice book by FW and we can only hope for more publications of the same quality. It is lavishly illustrated as well, even better than Tamurkhan and full of little stories making it a pure pleasure to read that book. Definitely worth getting! One of the things I was on the lookout for at Salute was some sort of addition to my Very British Civil War force. I managed to pick up lovely armored truck from Scheltrum miniatures that will fit in just fine. Powstaniec (or “Insurgent” in English) was an improvised armored truck used by Poles during Silesia Uprisings in 1919, when newly reborn Polish state was fighting with weakened Germany over control of disputed Upper Silesia region. I am not planning on playing any games involving that particular period, however as with all other improvised armored cars and trucks they are usually perfect for use in VBCW for any force really. Powstaniec is not different in that respect. For 20 quid we are getting big block or resin and separately 5 machine guns and set of 4 wheels. Obviously assembly is really simple as you basically only need to stick few metal elements on a resin main body. Cast itself is rather good- on a main body there is no mold lines to get rid of and only tiniest amount of flash, which is always good sign. Machine guns require a little bit of work with cleaning flash and mold lines, but since its only few small elements, work takes hardly any time at all. As far as the model itself goes, it is pretty accurate. There is a bit of a difference from the original truck though, as the model has differently shaped turret that original Powstaniec (you can see on historical pictures that turret was round shape, not box type that Scheltrum did). As however most of people are going to be using it for VBCW, this is not a problem at all and ever for a historical game in that period this is a very minor issue as well. All other detail is pretty crisp and accurate and at 20 pounds I find Powstaniec truck a good purchase and can thoroughly recommend it to both modeller and anybody playing VBCW (or Silesian Uprisings). With 3rd edition of Flames of War air support is becoming much more popular choice, therefore I decided that my Soviets need bit more proper AA defence than Dshk machineguns on trucks. I do like my support choices to be as mobile as possible so M16 quad AA haltracks from lend-lease American aid were obvious choice for me. After quick search I found out that the cheapest option would be buying set of 3 sold by Forged in Battle. Being at the Salute it wasn’t difficult to locate the box and 13.50 pounds later I was a owner of brand new set of those vehicles. So what do we get in the box exactly? As you can see on the picture below there are 3 resin halftracks with bases attached to them (some people don’t like it but personally I really don’t mind), metal quad AA gun consisting of 3 elements and 3 crew for each vehicle. Since the crew is American they will be of no use to me, but for those that are interested there is a driver and 2 sitting crew figures. Let’s have a closer look at models themselves. I had been eagerly awaiting release of that set from PSC. Finally it was out and after a visit to Onslaught Games in Brighton I had that little box in my hands. I was unable to write that review earlier due to me being away, but now I am back and it is time to finally write it! So for 16.50 pounds (or bit less if you buy the box off Onslaught Games or other online sellers) we get a nice looking box of hard plastic miniatures which are already becoming more and more popular, especially among Flames opf War players. Inside the box we get 4 Maxim HMGs, 4x50mm mortars, 4x50mm mortars, 4×82 mm mortars, 4x120mm mortars and finally 8 PTRS anti-tank rifles (in two different poses). 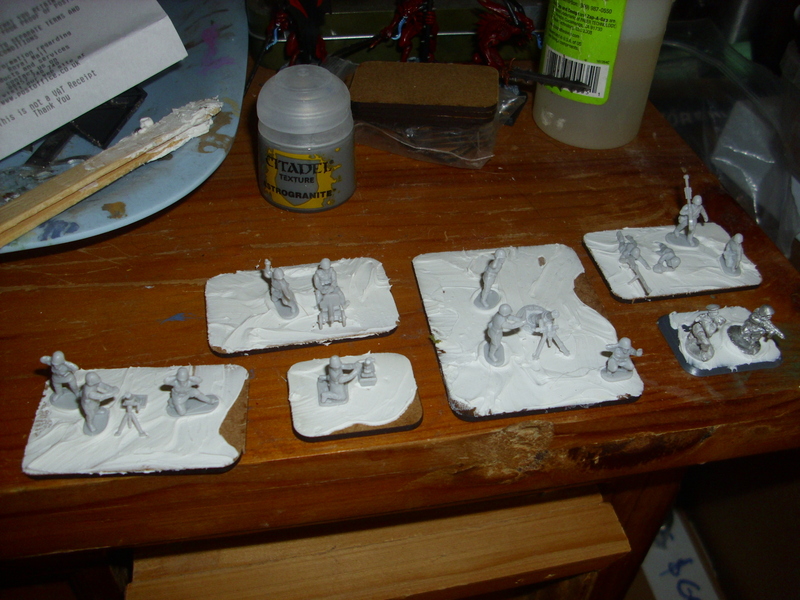 Everything comes on 3 sprues. As you can see on the picture some models are multi-part, probably due to the nature of material. As usual with PSC products it looks worse than it really is and actually they assemble very easily and fast, all elements fitting perfectly. Models are made very nice and there the detail is surprisingly high. There is no flash and occasional mold lines are no problem to remove. My only grip is with poses for anti-tank rifles. Since there are only two and for FoW it is generally a good idea to put two rifles on one base, they look bit odd together, as one is laying in shooting position and other one is very static, with a soldier simply standing with a weapon on his shoulder. Standing model would look much better in more dynamic pose. Mortar crews look amazing with soldiers covering their ears, although one of them holding a shell looks more like he is holding ammunition for a gun, not mortar, but those are minor problems. 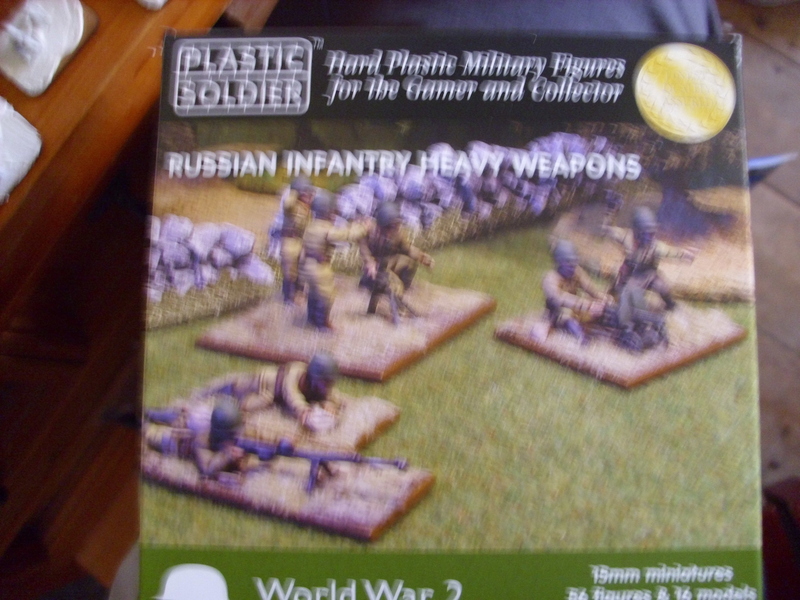 Models also scale really well with Battlefront ones and for that price whole set is simply a great bargain, allowing you to add support weapons to more elite Russian formations such as Sapper-Engineers or if you want to form weapon companies, especially prevalent in Mid War Russian lists. Definitely recommended! 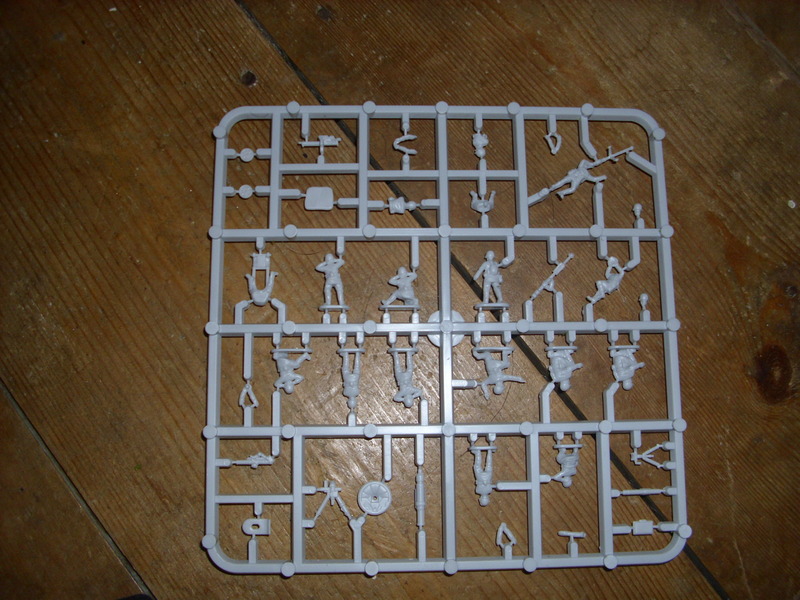 As usual whole set comes without any bases, but few pounds spent in warbases.co.uk will get you everything you need. Similar amount of weapons from Battlefront would cost you a lot more.